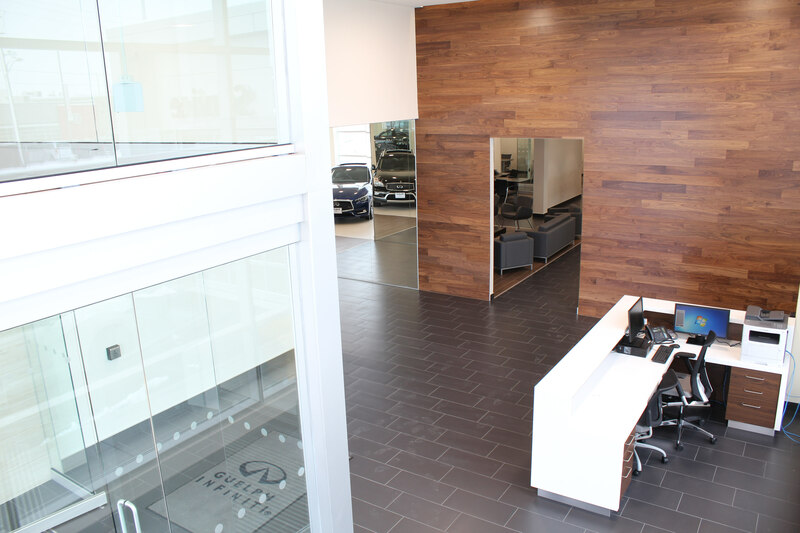 After 25 years of proudly serving guests from Guelph, Guelph Infiniti New Location Now Open! 943 Woodlawn Road West in GuelphKitchener-Waterloo, Cambridge and the surrounding area at its original location, County Road Auto Group and Guelph Infiniti are excited to start a new chapter. A brand new, state of the art facility has been built on the west end of the Guelph Auto Mall, located at 943 Woodlawn Road West. The new standalone Infiniti location is the first in Canada to adhere to the Infiniti Retail Environment Design Initiative (IREDI) Revised. As well as the only standalone luxury vehicle dealership in Guelph. It features a modern design with open lighting and natural materials which provides our guests with a luxury Normal 0 false false false EN-CA JA X-NONE experience with every visit. Customers can expect dramatic enhancements in their experiences over the previous location. The advances begin with an expanded 25,000 square foot facility. Upon entering the dealership, customers find a gallery-style showroom, in which cars are displayed as art rather than products. The spacious showroom, which fits 6 Infiniti vehicles for display, is designed to feel more like a luxury hotel than a showroom. High ceilings with the latest in LED lighting technology, and a mix of open and closed offices are intended to eliminate intimidating offices. And instead create a comfortable environment, through the use of glass, wood and natural materials to open the space and put the customer at ease. Service will become easier and quicker with 6 service bays along with the latest in advanced diagnostic and repair equipment. A service drive-thru that is designed to house 2 vehicles at one time. Also a fully stocked parts department which will help ensure that your service visit will be as quick as possible. 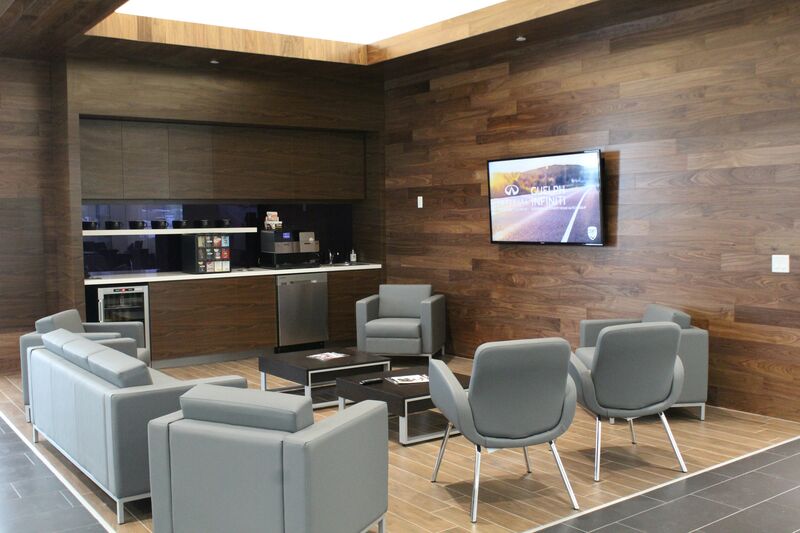 While customers wait, they can relax in our lounge with comfortable seating, a gourmet line of coffee and espresso and other refreshments, wireless internet access, and a host of new employees along with familiar faces to help the customer experience reach new levels. “While it has been a long time coming, I am very excited to finally have a state of the art facility to match the high end appeal of the Infiniti brand.” Said Glen Yates, County Road Auto Group President. The “journey” of owning an Infiniti should begin at our front door. I would like to welcome everyone – no matter what kind of vehicle you drive – to stop by and tour the dealership. We are very proud of it! County Road Automotive Group – One of Southwestern Ontario’s fastest growing dealer groups. Formed in 2014 by Glen Yates, the Ontario, Canada, company currently operates 3 dealerships, representing 2 nameplates, and 3 rooftop locations with more than 200 people employed. County Road Automotive Group offers comprehensive services that promotes a synergistic model for our customers. Offering a superior new vehicle buying experience that will ensure our customers return for service and future purchases.